Radhika has dressed up her kid in several fancy dress competitions held in school, society and other academies for about seven years. It's always fun to see kids dressed up in colorful costumes. In many places, high-quality fancy dress and costumes are available ready-made in shops for hire or sale. In a fancy dress competition, there are many lovely kids all dressed up and sharing the same stage. To impress the judges, you need an outfit that is homemade, hand-crafted, and unique. I have some experience in making fancy dress costumes. Every year, I’ve gotten to dress up my son for the fancy dress competitions held during Ganapati festival and Navratri Pooja. 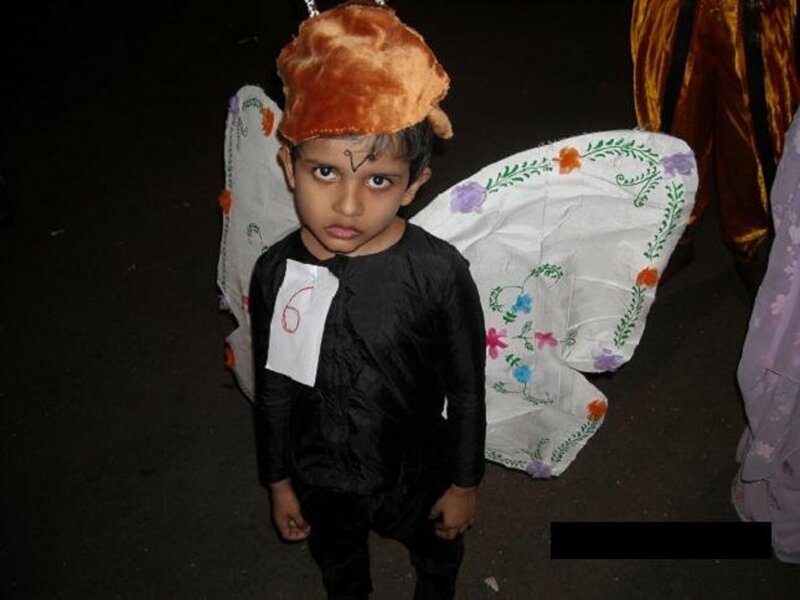 My son also participates in fancy dress competitions at his school. As a result, I've had to find and make an interesting costume for him to wear in the competition every year. Below I explain how I assembled the costumes. There are also some other ideas for fancy dress in addition to the ones that I've made for my son. Though it's true it might be simpler to hire fancy dress from shops since they have such a wide selection of costumes, it is harder to find an interesting and unique costume since most of them would have been worn by other kids in competitions held in the past. Normally, kids begin participating in fancy dress competitions in animal or bird costumes. 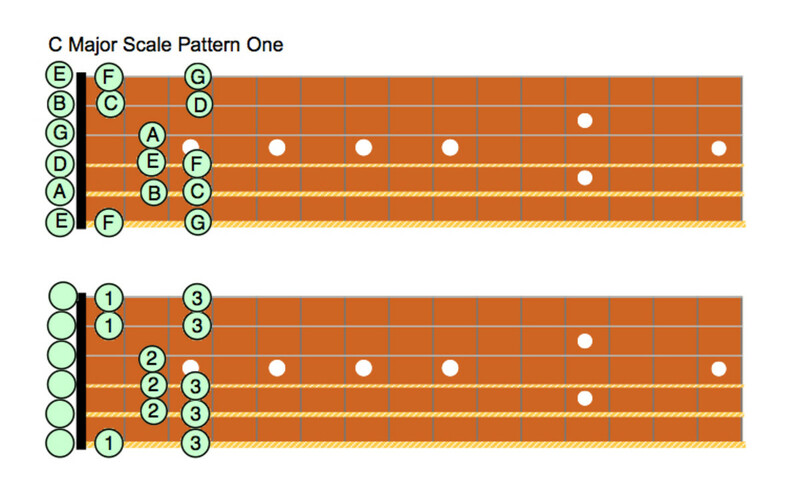 They don’t have to do anything very complicated for their performance. Usually, they only need to move on the stage like the animal they are dressed as. Many children would like to dress up as a butterfly, as did my son. For that, I had to figure out how to make a butterfly costume. I didn’t finish the costume in a day or hours’ time, however. I worked on this project whenever I got spare time, and luckily the outfit was ready in time for the fancy dress competition. I used a tight long-sleeved top and pants to make up the body of the butterfly. Usually dark colors work better for the butterfly body so it can accentuate the light color of the wings. I chose to go with a black and white combination for the entire costume. Designing the wings is a major part of this costume since it is the most noticeable part of the butterfly. To make them, I attached a white cotton silk cloth cut in the shape of the wings to a light-weighted base piece that holds clothes after they're ironed. I had no idea something like this existed until I talked to a craft shop owner. Due to the reaction of some chemicals coated on it, cloth sticks to it when ironed. It is not stiff like cardboard, though, so the next step was to figure out how to make it stiff and keep it on my son's back. For this, I bought a thin iron wire and bent it in roughly the shape of the wing. This wire, when glued on the back of the silk cloth wings, could bring up the butterfly wings and make them look alive. I then attached the wing to the back of the body by stitching, and decorated them with fabric paints and artificial flowers. To make the headpiece, I stitched together a cap using soft fur cloth. I stitched cloth around two drinking straws for the antennae and sewed those onto the headpiece. You can make your own peacock costume if you have enough feathers, but I found making the peacock’s plumage to be an extremely daunting task, so I decided to hire this blue costume with feathers neatly tied in a row. Some fancy dress may require you to paint your child's skin, especially their face or arms. I painted my son's face like the fan-shaped feathers seen on the crest of the head of a peacock. Dressing up kids with gods' dress is a popular trend in fancy dress competitions. 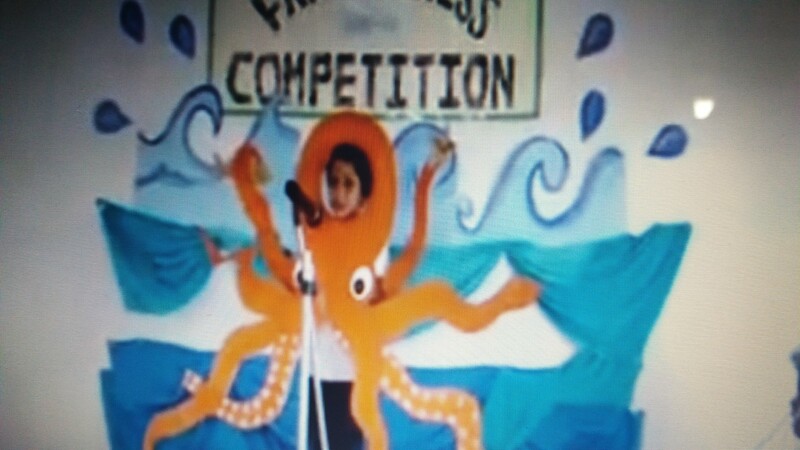 The year that my child wore this costume, he had to deliver a small dialogue in the competition at his school. 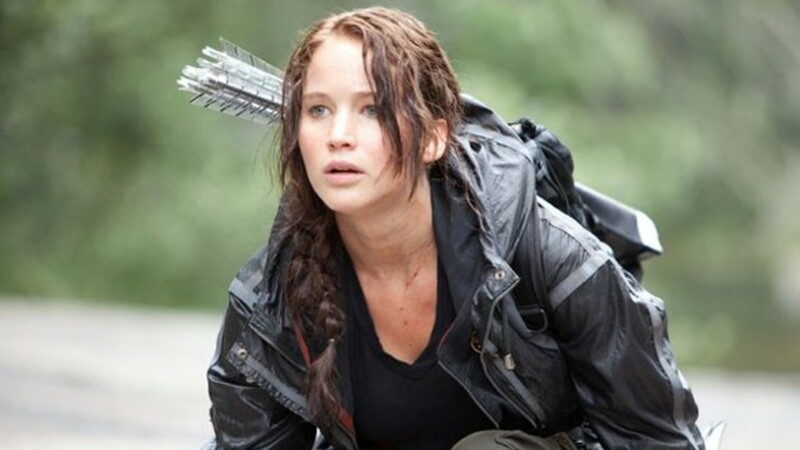 For this event, I made the costume myself with the bow and arrows held in God Sriram’s hands. First I stitched the top and bottom of the costume as shown in the picture. The ‘dhoti’ or ‘thaar’ in the bottom part consists of a silk draped border stitched on the middle and joined to a side. I designed and created all the ornaments, including the crown, armlets, bracelets, and waistbands using beads and stones. I made bows and arrows with bamboo sticks covered in gilt paper. For the arrow holder, I used brown paper and finished it with gilt paper. It was glued to the back of the dress to place the arrows in it. Makeup is crucial while dressing up as gods. Here, the dot on the forehead is a ‘Naamam’ which has a ‘bindi’ or ‘gopi’ surrounded by sandalwood paste. Many parents decide to dress up their kids like God Sri Krishna because Hindus are very fond of the God himself as a kid. I didn’t have to make much for this dress since I already had the ornaments I needed. The only thing I had to do was fasten a peacock’s feather to the top of the crown as Sri Krishna wears it. I bought a flute and decorated it using crafting materials. A North Indian bridegroom wears the traditional ‘Servani’ along with a turban decorated by glossy materials. I bought this Servani from a nearby shop and made the turban with a silk cloth. This is the costume that North Indians typically wear in a traditional dress competition. One year, the theme for the fancy dress competition at school was "peace." There were the obvious choices of a dove, swan, Mahathma Gandhi, or Jawaharlal Nehru, but I chose the costume of King Mahabali from Kerala. 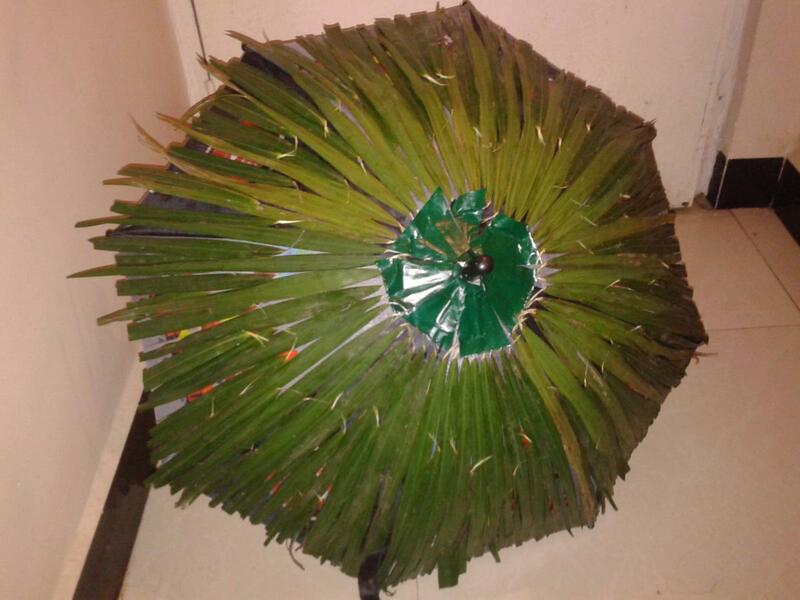 I just had to craft an olakkuda or leaf umbrella which the King holds while he visits his subjects annually. I fetched some coconut tree leaves from the garden and glued them to a kids’ umbrella using Fevicol. Gluing natural leaves is not an easy task, as they need some time to stick to the cloth. 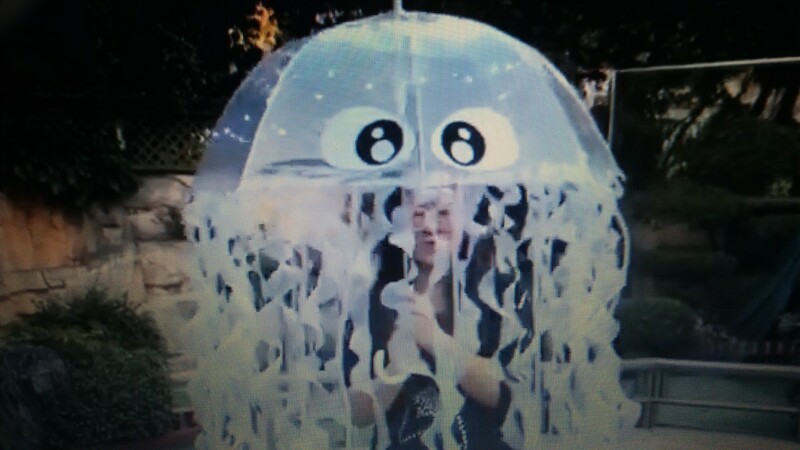 You can try using Crafty Glue for this, which is what it was meant to be used for. I also needed a moustache to complete the king look. For this, I collected some short hairs and glued them on double-sided sticky tape. The tape, when fixed on the top of my son's mouth, gave almost the look of a real moustache. 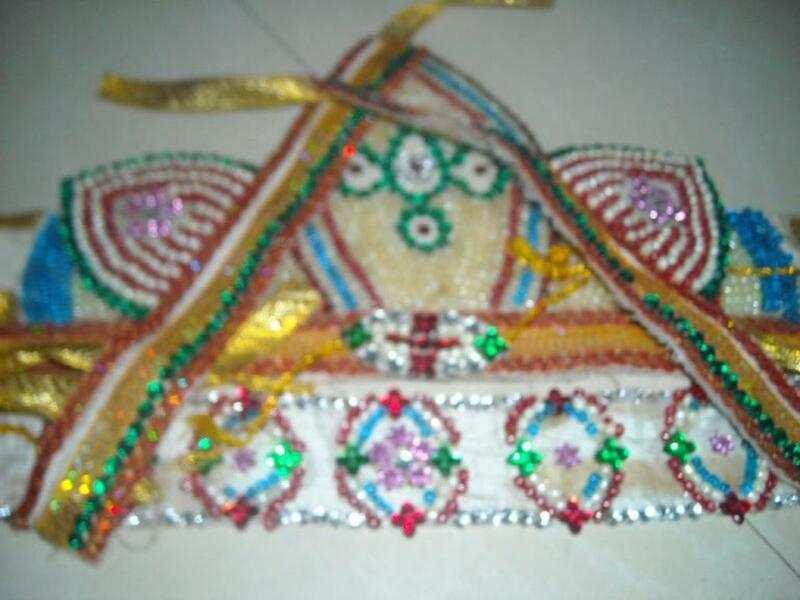 I had him wear the sleeveless top and ‘dhoti’ which I had prepared for the Sriram costume, and I wrapped his back using a silk shawl or uthareeyam inserted inside the waistband. And that's how King Mahabali got ready to attend the fancy dress competition carrying the olakkuda. 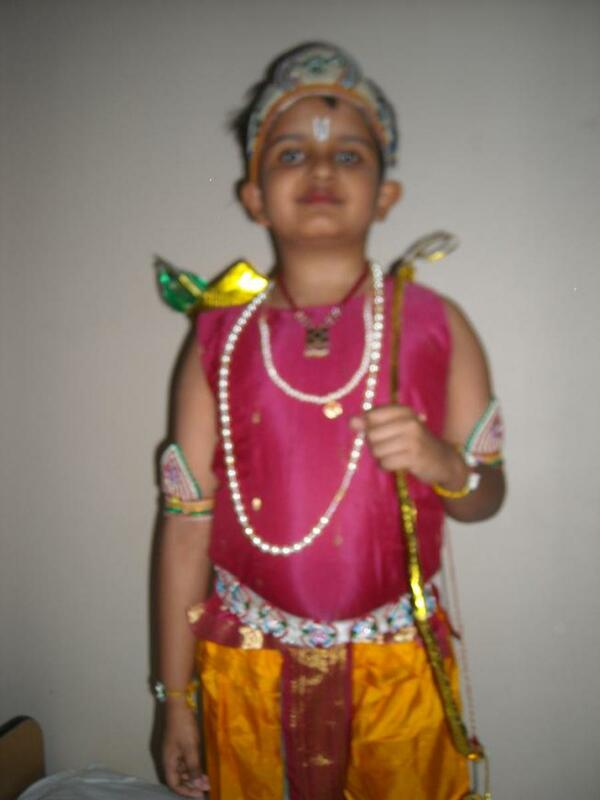 One year, my child had to act as Narada, the Vedic sage, in a skit arranged by his music academy. I went to a nearby fancy dress shop to enquire about the accessories needed to dress him up. The set was available there and I hired it. It included a dhoti, a shawl, and a rudraksham beads ornament set. It also had a wig with round, tied hair on a headpiece and the musical instrument like a veena and a rhythmic instrument which are carried by Narada during his chanting of hymns and singing of prayers. I had to buy some jasmine flower strings to form the garland and to decorate the tied hair. For the rest, I dressed him up like that of the Gods as mentioned above. Apart from these costume ideas, Santa Claus, soldiers, folk men and women, robots, and spider man are some of the outfits that catch our attention during this event. Which dress do you like from these ideas? Kids love birds and those having colorful body, thick tail, feathers and crest look gorgeous in a fancy dress competition. Though there are several bird costumes possible, I suggest a few of them to try for your kid. 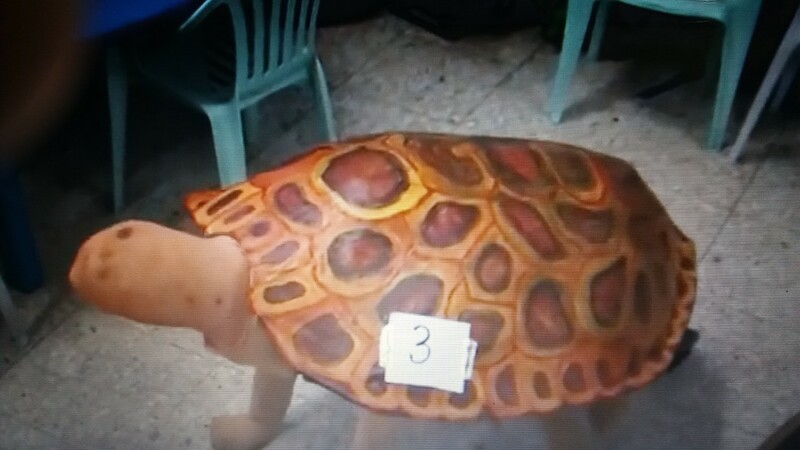 Though there are a hundreds of ideas from the animal world are possible, some costumes linger in the minds of spectators with their showy appearance. Let's look at some of them. One of the political leaders whose name comes to our minds first is our own prime minister Mr Narendra Modi. Sonia Gandhi, Rahul Gandhi all also have secured their own place in the field of politics. Indira Gandhi, Rajiv Gandhi, Atal Bihari Vajpayee, Sushma Swaraj, Arvind Kejriwal, Manmohan Singh also can be chosen to dress up as a political leader. Anna Hazare can be chosen for wearing fancy dress on the theme of social activists. His dialogues are so elegant that they can win the minds of the judges as well as the audience. Also some of the ideas that pop up in my mind are Medha Patkar, Kiran Bedi, Baba Amte and Lal Bahadur Shastri. Hi, My daughter is in L.Kg and has a fancy dress competition in her school can you give me some ideas for her. I want to dresssup my boy as a sparrow in school fancy dress competition. Please give me some ideas for this. My daughter is 3yrs old she is in nursery. Her school has fancy dress program on 6th Nov. she needs to go dressed as Lotus/Lily n speak few words. could u plz suggest me about the dress Lotus/Lily. How dress up girl kid like turnip?....and how to decorate to hair like leaves of turnip. hello madam, my kid is 4 year old. I want to show him as Robot for fancy dress so plz tell me the accessories n costume for him so that i can prepare myself. I have several times mentioned in previous comments that you can google to get dialogues. All the best. You might have heard of small butterfly poems or songs. 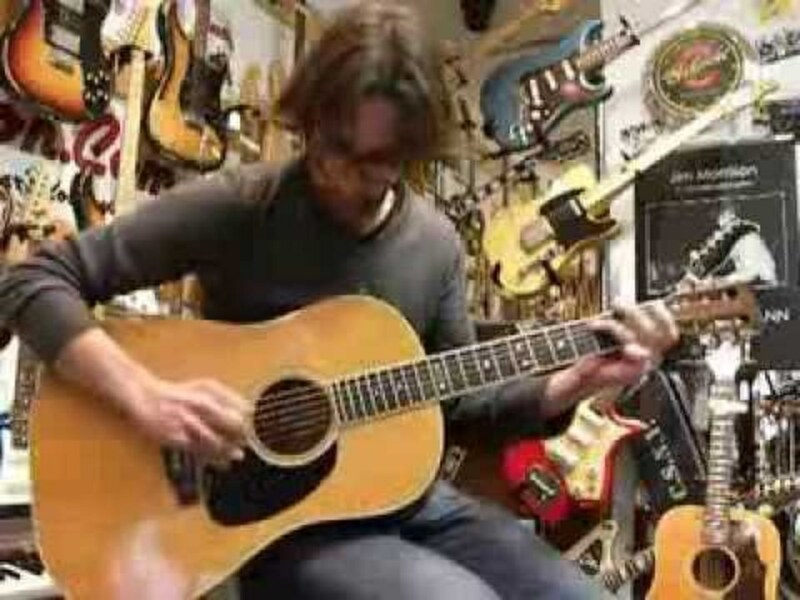 Google it and choose the one you like. All the best. Can you give some fancy dress ideas on moral values for four year old boy. Pls help me. Is it just newspaper or newspaper boy? My son is in 1std and since I don't have much time can u pls help me out bcoz tomorrow is making of newspaper fancy dresss can u L's help me out what and how can I make ? Thanks Ahdilarum for the support. Glad to know that you liked Mahabali costume. Yes. Fancy dress will always boost up the children as they will be viewed in different avatar. I liked the Mahabali costume a lot. Hi, I want to dress my child who is in 1std as krishna . Please send me some photos. There are several ways possible to show the theme 'stop pollution'. One simple way is to write the importance of stopping pollution in a cardboard cut in some shape. Hang it over her head using a rope and teach her some dialogue that go with it. Or give her some cloth bags to wear and let her tell "Say no to plastic to stop pollution......" and so on. Extremely sorry for replying back to you. I could not access internet for the past few days. So, I'm not coming up with any ideas as the competition would be over by now. Hope you all might have dressed up your kid in the way you like. please suggest three or four lines for spiderman ..in fancy dress competition asap. As the topic is 'me and my mother nature', I think you can choose a costume for anything you like in Mother Nature. I've already given a reply on how to dress up as Mother nature in the comments part. Either you can choose a single creation of Mother nature or the whole. 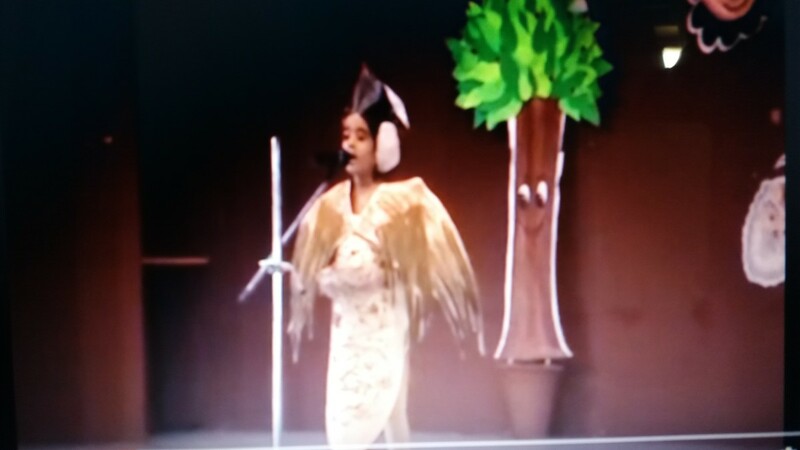 my daughter is 7 year old.suggest me some costume for fancy dress competition.topic "me and my mother nature"
Without seeing your daughter, how can I suggest one for you? I've answered this question several times, please go through the comments part. Choose one dress from the ideas I've put forth, if you like them. All the best!! I'm hearing about such a competition for the first time. Even dressing up the kid has become tedious, then how you're also going to accompany him? Strange! Your dress idea has put me in a puzzle. Making T.V. models that look live is not an easy task. Also, you can't differentiate between old and new T.V. models in disguise. To present yourself as a T.V. , take a square cardboard sheet and portray a T.V. screen with all the elements seen in it. Either you can paint or stick 3D elements to make it more appealing. Tie it on the front side of the body and present yourself. I don't have any ideas for presentation. What triggers me is showing some old and new T.V. ads. All the best!! Having a fancy dress competition at my son's school. Both me and my son have to dress up as TV(Old and new).It would be of great help if you could give me some dressing up tips..to present ourselves on the stage, and how to make TV models. For Mother Nature, you'll have to show all those elements mountains, rivers, trees, flowers, sun etc. Making these in 3D form is very difficult and time-consuming. What I suggest is paint river in a long piece of paper and tie it on her front side. Similarly paint mountains in another paper and wrap it around her head. Paint the other elements trees and flowers in two lengthy papers to cover her hands. If doing this is tough, then paint the entire natural scenery in a square sheet of paper and tie it on her body. You consult your friends or others for any ideas and select the best one. All the best! You can dress him up as a T.V. , laptop or video game player. I think this idea is time-consuming. All the best. i have to dress my child of 4 years old resembling someelectronic gadget.. what could bethe best for this??? Kerala Kings such as Pazhassi Raja and Veluthambi Dalawa are seen wearing Mundu in addition to the traditional attire. You can Google the images of Pazhassiraja to see the different style dress ups. Wish you all the best. 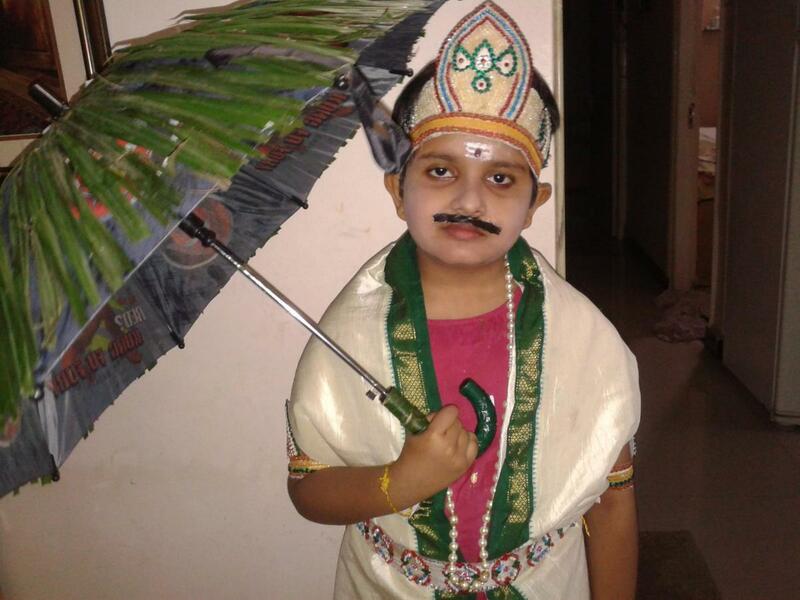 Hi, I want to dress my son 5+ years old with Mundu (Kerala Style) will U give me some suggestion and send me photos. I've replied to the same question asked by Shruti in the previous comment part. Please refer to that. How many beautiful things we see in our daily life in this world? Butterflies, birds, flowers, trees, small animals(that won't cause any harm), social activists who help poor people like Mother Teresa are all beautiful. Singers, dancers, poets also are included in this list. Choose from any of these characters and dress up your kid like that. I've already described how to dress up as butterfly and peacock in this hub. Wish your kid all the best. My daughter is having a fancy dress competition with theme Our Beautiful World and People who help us. She is in LKG..Can you suggest some ideas. hi radhikaji my daughter is 5yrs old and she is participating in fancy dress competition and the topic is our beautiful world.plz give me some creative ideas. Dress up your kid in your state's traditional dress. Without knowing your state, how can I help you? 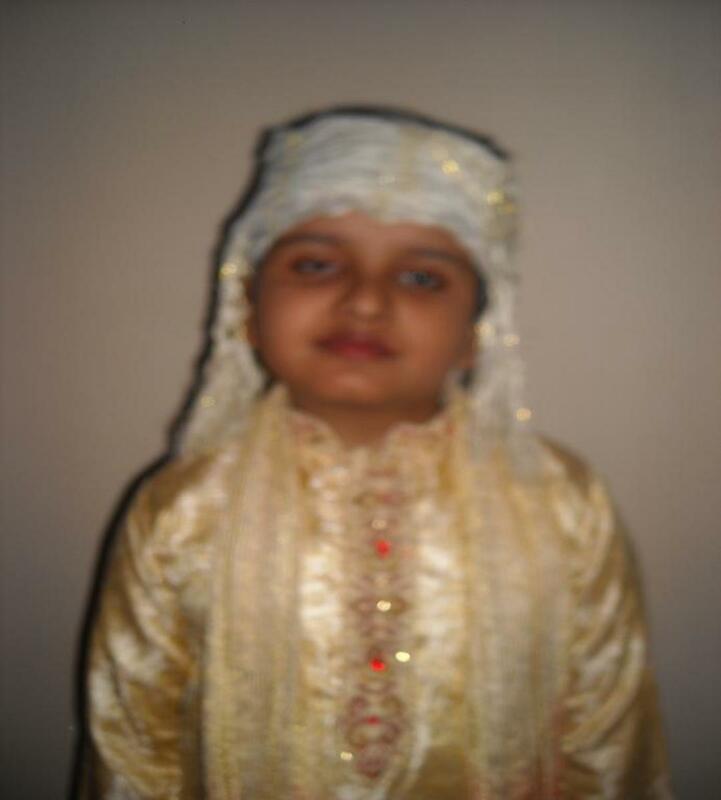 Dressing up your kid in traditional dress is easy as it is the dress you need in special occasions too. I'm not that much good in framing dialogues, I think. But as these personalities are social activists, some of their famous quotes or slogans will be available in Google search. For eg, Mother Teresa's simple and short quotes such as "Peace begins with a smile" or "If you can't feed a hundred people, then feed just one" can be appealing to hear. plz tell me two lines each of characters i.e. mother teresa,kalpana chawla,rani lakshmi bai,kiran bedi,shabana azmi as social activist. You can Google for images of newspaper boy. Several kinds of boys in different poses can be seen there. As this dress don't require much decoration, I think it's the dialogue that gives him the real image of a newspaper boy. Dress him up with a casual top and pants, wear hat on his head and give a bunch of newspapers in one hand. With one newspaper in another hand, teach him say the dialogue that you've seen them shouting in public places. If possible let him ride a bicycle with some newspapers tied on its back. Tell him to say the dialogue loud as he rides it. All the best. hi, my kid is 4 + year old. I want to show him as newspaper boy for fancy dress so plz tell me the costume for him .and give tips for this theme. You can choose any dress from these ideas or one that triggers you. Choose a simple dress without much decorations as the kid is very small. An animal or bird dress would do, I think. All the best! 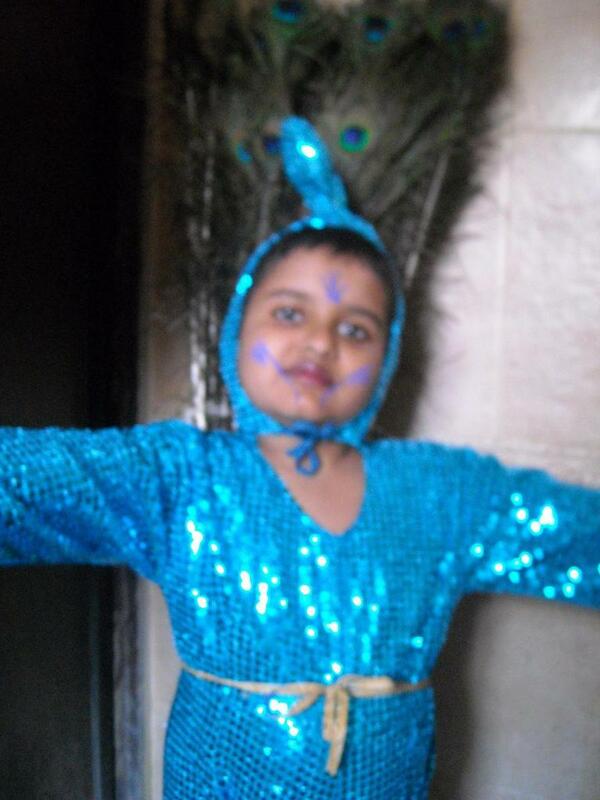 My kid is thee +year old(boy -Nikunj Sharma) ,a fancy dress comptition will be in school . Are you a Himachal native? If yes, you may be very well knowing about your culture. Find out 4 or 5 lines that folk girls talk in that language. If you're dressing her up on the auspicious occasion of Ganpathy, either she can sing first few lines of some devotional song or she can chant the Sanskrit Ganesha mantra "Gajananam Bhoothaganadi Sevitham........". Add your own ideas to this and find success! 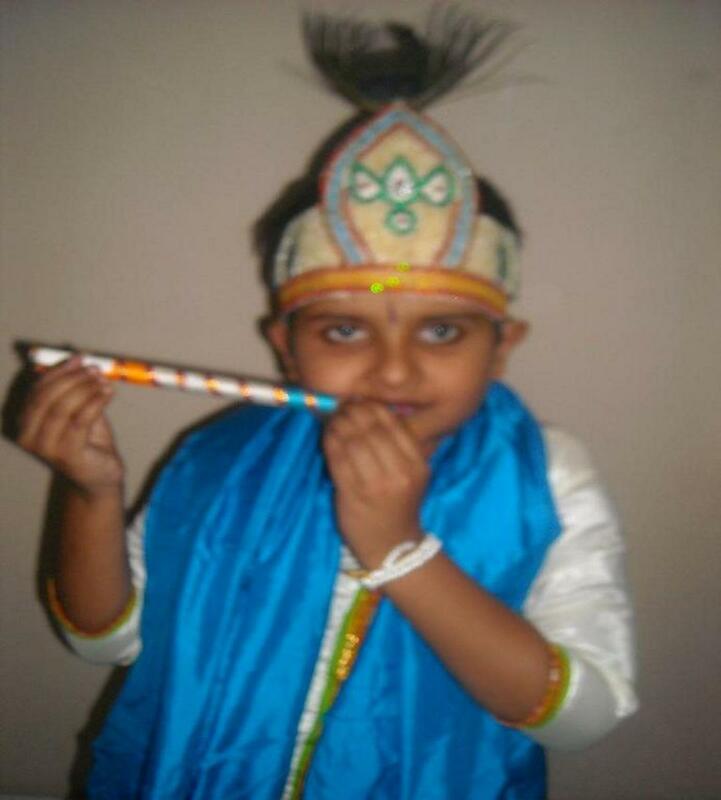 Great to hear that you're costuming your kid as Lord Krishna. I've explained everything needed to dress kids as Gods in this article already. Several attires are possible for dressing up as Sree Krishna, one that I've shown here. Usually, South Indians would wear a dhoti, a shawl wrapped through the back till waist, a crown with a peacock feather and the necessary ornaments to adorn. But North Indians would wear a top(shawl optional) too. You can choose from any of these and do dress up. Happy Janmashtami(Sree Krishna Jayanthi)! aapne tho ek odd sawal kiya hai. If you can tell me the theme of the dress, then I hope I can help you. A dress that cannot be identified with a character is what is "odd"!! An army officer has got several slogans to impress the audience. "Jai HInd", "Mera Bharat Mahan" are some of them. You can make your kid sing the first four lines of the well-known song "Nanha munha raahi hoom" from the film Masoom sung by Shanti Mathur. Youtube will be able to help you more regarding this. All the best. hi....i want to become my son an army officer in his fancy dress competition.Can u suggest me that what he should speak in his competition to impress all in his school and to win prize ? Your daughter can dress up like a butterfly or a peacock. Costumes of birds like parrot, dove or sparrow are also seen worn by small kids in a fancy dress competition. Any dress becomes best when it suits well for your daughter. Also, right make up is required to bring out the figure you've chosen for your kid. A little sense of creativity and crafting hand can dress up a kid with the best. 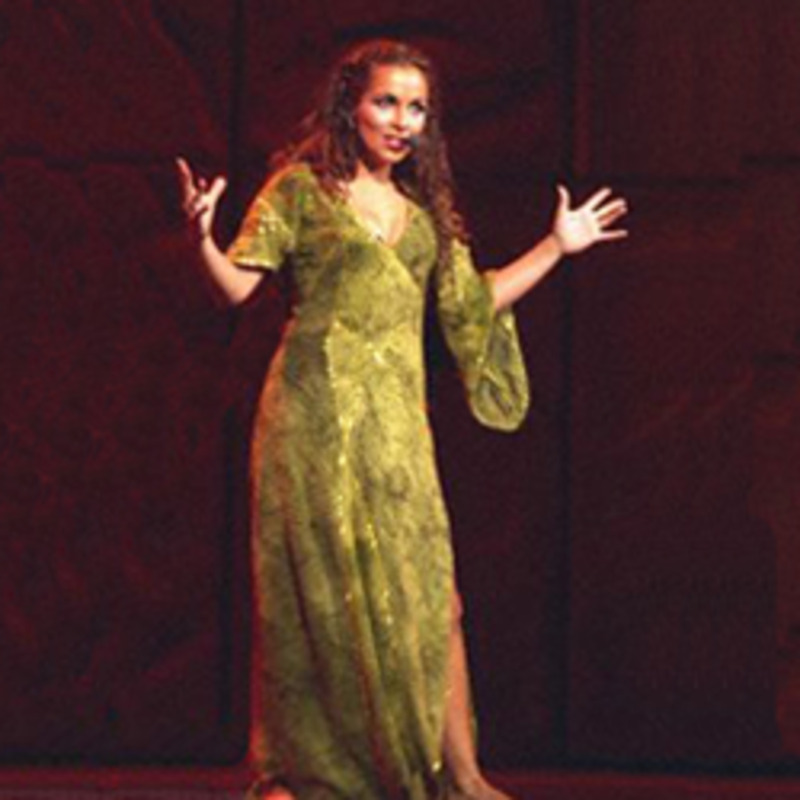 With a short act filled with expressions, she can take the audience in her hands. If dialogue is required, teach her to tell a small line based on the dress she wears. When it comes to freedom fighters, males have the choices of Mahathma Gandhi, Subhash Chandra Bose, Sardar Vallabh Bhai Patel as always. Females can choose to dress up as Rani of Jhansi, Sarojini Naidu, Kasturba Gandhi, Indira Gandhi or any other leader who've fought for the liberation of our country. You can find out their attire by searching their names in 'Google'. Hope that helps. Wish you all the best. My daughter is 3 yrs. she is participeting in Fancy dress Let me know which can be the best for kids to manage on stage and give tips on freedom fighters. This dress seems to be an odd one. Plastic paper dress don't seem to be the one that needs to be crafted by hand. Just clip the edges of the paper on the body and if possible, make it look stiff and flat. No more ideas trigger my mind for this. There are so many dress ideas that you may consider when cost becomes a concern. Nature dresses such as plants, trees, flowers may not cost much. You can pluck some leaves or leaflets from the garden and tie them together to form a circular shape with a rope. Note that the rope size fits properly for your daughter. Then put a knot on the edge, make more leaf circles like this and make her wear them on top. Cover the head also with leaves. Now she may look like a tree. You can add your own creative ideas to enhance the look. Cut color papers in the shape of petals. Tie or fix them together on the edge of a rope so that the rope when knotted looks like a flower. These are some simple ideas to dress under minimum cost for a fancy dress competition. I'm so glad that you liked these costumes. The costumes of gods and king really reflect light on Indian culture. Thank you for stopping by and passing a comment. Very cute costumes! Thanks for giving us a glimpse to your culture through these costumes. Voted up and interesting. It depends on the kind of politician you're going to make. Listen to their recent or famous slogans and then frame the dialogue. Hope that helps. Thanks pringoooals for giving such a nice comment. Indian culture is loved by many and the traditional and devotional dresses of Hindus are spellbinding. Thanks for the votes too. I like the peacock, however as you say preparing this sort of dress can be really time consuming. I like the bridegroom dress as well. India has a lovely culture, and dresses are absolutely outstanding. Voted up! Thank you so much Nell for the great comment. I'm glad that you liked the photos and I can't wait to see the photos of your son being dressed up as a bear at school. Thanks for the rate. Hi, wonderful tips on how to dress up kids in fancy dress, and the photos were so lovely! I remember my son dressed up as a bear at school, I still have the photo somewhere, they look so cute, rated up and shared! I'm glad that you've got some ideas to dress up your kid. She would have looked wonderful in Goddess Saraswathy's dress, I guess. Thanks for the appreciation and the peacock dress would make your kid happy. Thanks Radikasree for answering my question! Now I have lot of ideas to dress up my daughter. As you said it is usual to dress up the kids like Lord Krishna, I have done Krishna dress up for my daughter when she was 1 year. Later I tried to do an instrument veena in cardboard and dressed her up as Goddess Saraswathi. Now after reading your hub I'm thinking of trying Peacock dress-up! Your kid looks great in the Bridegroom dress.Wonderful hub! I always like your creativity and the patience in explaining your craft works!